​​​​​ Des Moines Area Community College's (DMACC) Health Care Administration programs have expanded to teach new skills in working with Iowa's aging population. DMACC's new track is now known as Aging Services Management. The goal is to provide knowledge and skills about the needs and services affecting older adults and their families. If you like to work with older adults, the DMACC Aging Services Management Degree has several programs that will be of interest to you. The courses are designed for the working adult student. You will study gerontology, governance of agencies and facilities, management, human resources, legal issues and accounting. You can select one of several tracks. The Aging Services Management Adult Services Track AAS degree provides students with the coursework to qualify as administrators or directors of residential care facilities, assisted living programs, adult day care programs, home and community-based services and other agencies that work with the elderly. Administrators or directors play a vital role in planning, organizing, staffing, directing and controlling the operation of adult services programs. The Long-Term Care Administration AAS degree track provides students with the knowledge and skills needed to perform the duties of a nursing home administrator. Administrators play a vital role in planning, organizing, staffing, directing and controlling the operation of a Long-Term Care Facility. To be eligible to be a nursing home administrator in Iowa, students will need to transfer to a four-year college or university and complete a BS/BA degree. Students in the Adult Services Certificate of Specialization program have the opportunity to increase their knowledge of the older adult and the agencies that provide services for this expanding population. No prior degree is required to enroll in this program. This program offers classes in a format to meet the needs of the nontraditional student. For students interested in residential care facilities work, it is recommended to also take a course in general psychology and introduction to sociology. The Long-Term Care Administrator-Practicum certificate is designed for students who need 12 credits of practicum in a Long-Term care facility to meet the Iowa Board of Nursing Home Administrators eligibility requirements for the NAB exam. The Gerontology Specialist certificate is designed for individuals working with our growing older population. The goal is to increase knowledge and understanding of the aging process and how to better relate to the older adult. The certificate will consist of eight one-credit courses on the web with face-to-face seminars, offered to a cohort group, over a two-semester period. View Dietary Manager Specialist Certificat​​​e infor​​​mation. ​​Use any of the links above or on the left of the page to browse through our programs or find contacts for more information about earning a DMACC Aging Services Management Degree. 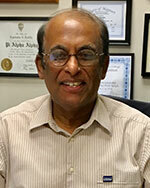 ​Raj joined the Aging Services Management program (ASM) at DMACC as a full-time faculty member in May 2013. Raj is a licensed Nursing Home Administrator with over 12 years of experience managing skilled and long-term care facilities in Iowa. After obtaining masters and doctoral degrees, Raj spent several years working in a variety of professional environments including teaching, conducting biomedical research involving neurodegenerative diseases, and health care information management. Because of his passion for working with older adults, he earned a master’s degree in health care administration from Drake University. He teaches a number of health care administration credit classes to students interested in management careers in post-acute care settings. Raj is married to Manju who is a professor of nutrition at Iowa State University. Their daughter, Shilpa, is a pediatric neurologist at Vanderbilt University Children’s Hospital and lives in Nashville, TN with her husband, Kevin.